Jenn Turnham > Blog > Jenn Turnham's Words > Adventure Deficits are bad for us! 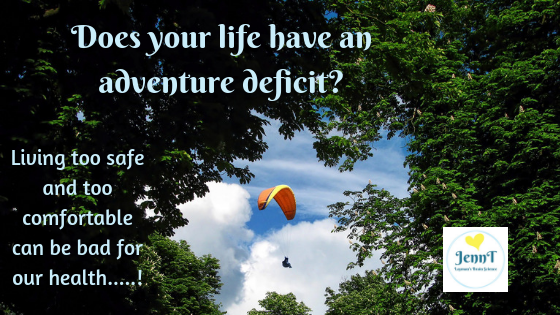 Adventure Deficit – it’s a ‘thing’…. Are you suffering from a lack of adventure in your life? Are you filling the void with unhelpful behaviours, or relationships….? We have managed to create an adventure deficit in today’s society because we have made life a little too comfortable. Most of us have have heating for when we’re cold, aircon when we get too hot, an alarm system to let us now about intruders or thieves, a retirement plan to look after us in old age, air bags to protect us in our cars and the list goes on, and on, and on…. The problem is, we have so many things that are designed purely to keep us safe and comfortable and we we have become experts at reducing risks to the point where I would argue, we have now gone too far! We wrap children in so much cotton wool, that they are heading in the opposite direction, and pushing boundaries and doing everything they can to seek adventure, danger and risk. As humans, it’s innate that we crave adventure – it makes us feel alive and our brain is satisfied because we have survived… after all, our brain is hardwired for survival….